Alarm system design and engineering that meets National Fire Protection Association standards, state requirements, and local codes. 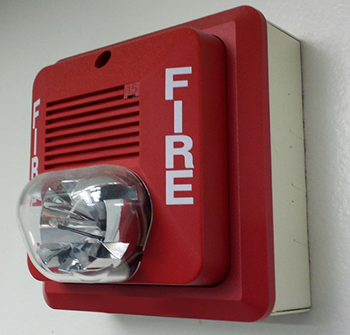 Fire alarm submittal package provided to the Authority Having Jurisdiction (AHJ), typically the local Fire Prevention Bureau, for review, acceptance, and permitting. Functional test of all components of alarm system and certification. Full acceptance test as required by the AHJ. Training and instruction on use. Full functional tests of your Fire Alarm Control Panel, Remote Annunciator, and Auxiliary Power Supply on AC power and battery back-up. Verification of communication with the Dispatch Center, and assurance that alarm, trouble, and supervisory signals are being received properly. Activation of input devices (smoke detectors; heat detectors, duct detectors, pull stations; monitor points, water flow switches, tamper switches, kitchen fire suppression systems, door releases, fan shutdowns, and elevator recall and shunt trips) and confirmation that the locations and/or addresses are correct and clearly labeled at the Fire Alarm Control Panel. Cleaning and testing of all accessible input devices. Activation and verification of the proper operation of all notification devices (horn/strobes, bells, strobe lights, zone indication, and auxiliary control functions). At Heritage Fire, we believe in the principle of giving you “added value” for your life safety dollar. For example, in reference to the device list shown above, water flow and tamper switches are part of your fire sprinkler system, and kitchen systems are pre-engineered fire suppression systems. Both of these require separate inspections to ensure proper operation. Whether you’re doing a large commercial installation or a smaller job, the IntelliKnight Series has the right addressable panel for your needs. IntelliKnight 5820XL, 5808, and 5700 makes set-up simple by automatically initializing detectors. Plus, it continuously monitors their operation, provides drift compensation, controls detector sensitivity, and performs an NFPA 72-compliant sensitivity check. Silent Knight gives you the capability to design an affordable, addressable system for any facility. Managing your facilities has never been easier! The IntelliKnight Series has the right addressable panel for your needs. IntelliKnight 5820XL, 5808, and 5700 makes set-up simple by automatically initializing detectors. Plus, it continuously monitors their operation, provides drift compensation, controls detector sensitivity, and performs an NFPA 72-compliant sensitivity check. Silent Knight gives you the capability to design an affordable, addressable system for any facility. Managing your facilities has never been easier!